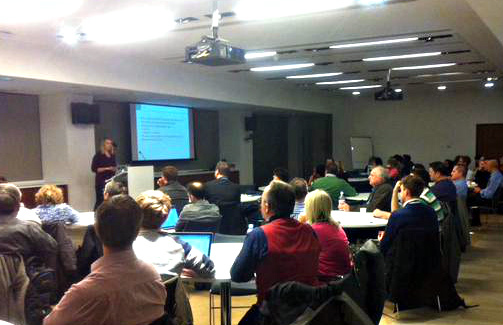 Some 65 people from across central government and the wider public sector came together on 11 February at the National Audit Office for the third Government services analytics meet up. We originally conceived of the meet ups as a way for service managers and analysts working on the exemplar services to share stories and techniques. This has certainly happened, but we’ve gained a lot more interest from a wider set of organisations and services and a wider group of people interested in data and analysis. Anish and Faye introduced a new paperless service that HMRC is offering to Self Assessment customers. They explained how behavioural insights and A/B testing were used in the live service to increase sign up rates. It demonstrated the value of quantitative experiments in conjunction with the user testing that is already embedded in service design. Registered Traveller is a relatively simple form compared to many government forms. The aim was to screen out ineligible applicants and then capture details for those that are eligible. The initial form was split into two sections with longish eligibility section. Travel purpose was the most complex eligibility criteria and Google Analytics showed strange behaviour when users were presented with the travel purpose they had previously selected earlier in form. The form was redesigned to make it simpler, which gave better results. Similarly, when payment was introduced there was a significant drop out at payment. GDS advised that payment referrals were an issue and updating of the referral exclusion list fixed this problem. Conclusion: even the simplest form can be improved. In this talk Georgina and Chris ran through the tools and metrics GDS use evaluate social media conversations and explored their use of Brandwatch, to measure the impact of conversations around GOV.UK, the exemplars (specifically CAP) and other government services. Peter presented data on how misleading websites use paid search and different domains to confuse users trying to access government services. He updated the meeting on the data that is collated to make the case to search engines and authorities that this is a serious issue. After a short networking session, the meet up concluded with short workshops and surgeries on SPLUNK - a tool for analysing audit data used on the digital platform, a Google Analytics Surgery, a Piwik surgery and a discussion about user research and digital analytics working together more effectively. The next meet up will be in April. To find out more, join the Digital Analysts UK Government Services group.